Homemade chocolate wafer cookies: Ditch the store-bought wafers and EASILY make your own for pie and cheesecake crusts, sandwich cookies, or icebox cakes. 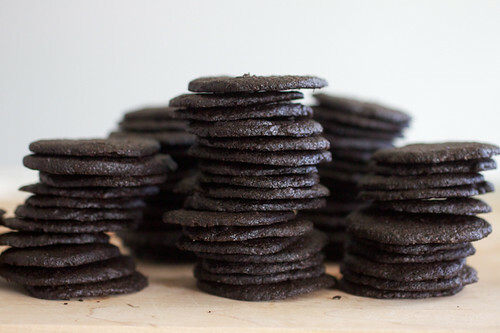 Since scratch baking is such an important aspect of what I do in my kitchen, it’s really no surprise that I should find and fall head over heels in love with a version of homemade chocolate wafer cookies that perfectly mimics the packaged and hard-to-find Nabisco Famous Wafer variety (especially if you don’t live in the US!). You already know my feelings on making graham crackers, Wheat Thins, and Oreos (to name a few) at home so to that end, I knew I would love make chocolate wafers at home too. 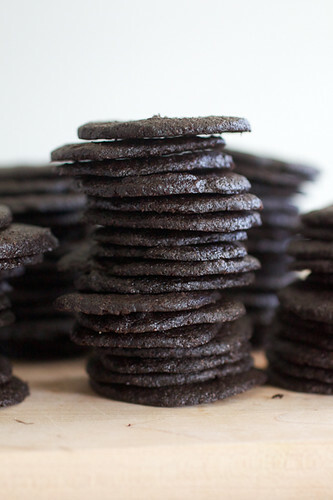 Chocolate wafer cookies are thin, light, crispy, and intensely chocolatey cookies. 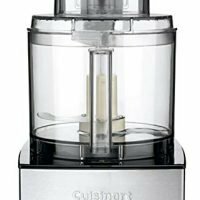 They are often crushed up into cookie crumbs to make crusts for cheesecakes and pies, or layered with fillings to make icebox cakes and ice cream sandwiches. What can you make with chocolate wafer cookies? Ground up in a food processor for a cheesecake’s cookie crust or the base of a peanut butter pie, you won’t be sorry you spent a few extra minutes making these slice and bake chocolate gems. Icebox cakes and cupcakes are usually made with chocolate wafer cookies too. And man do I love icebox cakes! For an icebox cake or icebox cupcake, you layer the chocolate wafers with a filling like whipped cream or pudding. The crispy cookies soften from the moisture in the filling and turn into thin chocolate cake-like layers. You need for these crunchy wafer cookies to soften so that you can easily cut through the cake without the cookies flopping all over the place around the knife. You can also use chocolate wafer cookies to make ice cream sandwiches! YES!! Simply scoop some softened ice cream on top of one cookie and press another cookie on top of the ice cream. Place the ice cream sandwiches on a parchment-lined baking sheet and freeze them for about 12 hours. Same as with the icebox cake, you want to let the cookies soften before you eat these ice cream sandwiches so the cookies don’t crumble all over the place. What kind of cocoa is best for chocolate wafer cookies? The best kind of cocoa to make chocolate wafers with is dark unsweetened cocoa. This cocoa helps to make the cookie richly flavored and it gives the cookies a deep and dark chocolate color. Since there is a fair amount of sugar in this recipe, you want to make sure you use unsweetened cocoa and not sweetened cocoa or the cookies will turn out too sweet. The price points for these types of cocoa vary from lowest to highest on the list but I like them all equally for these cookies. These cookies are surprisingly easy to make into very thin cookies. Just like the slice and bake cookies you can buy in a tube in the grocery store, you will roll your homemade cookie dough into a log and chill it. After 2 hours, the dough will be cold enough to slice into thin rounds. You’ll place the rounds on a parchment-lined baking sheet and bake them off for just a couple of minutes! Easy peasy slice and bake chocolate wafer cookies! One of the best things about slice and bake cookies is that you can make the dough and store it in the freezer for months. Simply roll the dough into a log and wrap it tightly in plastic wrap. Allow the dough to thaw in the fridge overnight before you slice it. Homemade chocolate wafer cookies are THE best cookies for chocolate pie and cheesecake crusts, sandwich cookies, and icebox cakes. Ditch the store-bought, hard-to-find version and EASILY make your own! In the bowl of a food processor fitted with the metal blade, add the flour, cocoa powder, sugar, salt, and baking soda. Pulse the ingredients a few times to combine thoroughly. Dollop the butter around the dry ingredients and pulse a few more times until the butter starts to incorporate and large chunks begin to form. Mix the milk and vanilla together in a small bowl. With the mixer running, pour the milk mixture into the feeding tube in a slow and even stream until the cookie crumb mixture starts to form together and ball up on the sides of the bowl. Transfer the cookie dough to a work surface and knead it a couple of times to fully incorporate all of the ingredients. Divide the dough in half and shape each half into a long and narrow log, about 1 ¼ inches to 1 ¾ inches in diameter. Depending on how large you want your wafer cookies to be will determine how thick to form the log. Wrap each log in plastic wrap and refrigerate for at least 2 hours or up to a week. Position the oven racks to the upper and lower thirds of the oven. 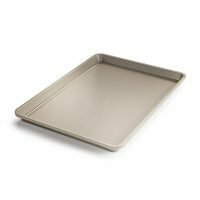 Preheat oven to 350° F. Line baking sheets with parchment paper. Slice the dough logs into approximately ⅛-inch thick slices and lay the dough rounds on the baking sheets about 1 inch apart. I formed my dough into 1 ¼-inch diameter logs and was able to fit 24 cookies on each of my baking sheets. Bake for 10-12 minutes, rotating pans from back to front and top to bottom halfway through the baking time. The cookies will be finished baking about 1 ½ minutes after the puffed-up dough deflates so try to keep an eye on them. Cool the cookies on the baking sheets on wire racks for 5 minutes then transfer the cookies to the racks to cool completely – they will crisp up as they cool. Storage: The cookies will keep for up to a week at room temperature if kept in an airtight container. Supposedly they freeze really well too but I haven’t tried it myself. If you plan to use these cookies in place of a certain brand of chocolate wafer cookies for a chocolate cheesecake or pie crust, cut out 1 to 2 tablespoons of the suggested amount of melted butter in the crust recipe. These chocolate wafer cookies contain a fair amount of butter and too much added butter in the ground up cookies crumbs will yield an absurdly wet mass of crumbs. Trust me. Nine ounces of these cookies (or about ⅔ of the recipe) will yield as much as 1 package of wafer cookies contain. Love the simplicity to these. Yum! These look great. I love a good chocolate cookie. Have you tried using Scharffen Berger or Valrhona cocoa? You might be surprised at the difference this can make. Love the idea of homemade wafer cookies. I love to use them, and sadly they’ve been getting harder and harder for me to find. Ahhh these look delicious and I love that you can use them instead of store bought! Totally bookmarked and saving this! Fantastic! These look so dark and chocolate-y…YUM. I’m so excited to try these! My favorite cheesecake has a chocolate wafer crust and I just realized that the popular brand of wafers they I’ve always bought at the grocery store uses partially hydrogenated oil. Yuck! I wish I had thought to start making my own chocolate wafers sooner! I baked these cookies today to get them ready for my chocolate mousse cheesecake. I didn’t try any of them, but my mother ate one or two or three of them haha and declared them yummy! I told her not to eat too many since they are “work” cookies (i.e. their primary fate is to serve as cheesecake crust :)). I used only 12 Tbsp of butter and allowed them to cook a few minutes longer than 15 minutes so that they would be considerably hard, but not burnt. Thanks for posting this recipe! I stuffed these with homemade whipped cream and froze them. So yummy. Yay!! I love the photo!! I can only imagine what these cookies would be like as frozen whipped cream sandwiches! I want to make a cheesecake but don’t feel like running out to the store so this is perfect. I’ll be making these now for a chocolate peanut butter cheesecake. do you think this dough be used as a crust ( remove some milk perhaps and press into a pie plate) without first baking it into a cookie?I’m in a time crunch here! thanks! Hi Sam! Absolutely! I did just that with the cappuccino fudge cheesecake I made a few years ago. Here’s the recipe for that (crust recipe included): http://www.smells-like-home.com/2012/12/cappuccino-fudge-cheesecake/ I made the cookie recipe as written but I do recommend cutting back on the butter in the crust when you go to make it since the cookies themselves have a good amount of butter in them already. Please come back and let me know how this works for you and what you’re making! YAY! I’m thrilled to hear how this went for you! Also, using this dough as a crust for chocolate cream pie sounds AMAZING! Big thanks for coming back to leave a review! Do you think pressing these between a tortilla press would work also? 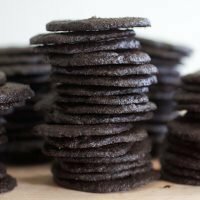 Looking to make super thin crisp cookies. Absolutely! This is a GREAT idea! Please let us know how this method turns out for you, Rachel!